Jim2 is very workflow and status driven. We recommend using key lists and workflow statuses to organise your staff. These can be built upon to efficiently manage all areas of your business. In order to save these recommended lists in Jim2, all lists must be pinned. The following is an example of a job list setup. An Unread list ensures any new email that arrives, which is automatically attached to an invoiced job, is brought to the attention of the appropriate user. The purpose of the New Jobs list is to allocate new jobs to the relevant available staff. Other staff would not require access to this list. In this instance, the list counter helps to flag to staff when a new job arrives. This would also have Name assigned as Logged User. Adding a priority of HOT helps staff to differentiate particular jobs from all other jobs being worked on and indicates they must be prioritised. An alternative label might be URGENT. The My Jobs list presents a full list of all jobs allocated to a specific user. Placing a job on Call status and keeping a list of these jobs suggests you are waiting on a client to respond or when you are required to call the client. Wait list status flags when a client has advised they will get back to you and there is no immediate action to be taken by your staff. Problem list indicates jobs that need attention prior to being invoiced. Jobs in this list would also include associated comments detailing what the problem is. Help lists are useful to flag jobs where technicians and sales staff require help on a job. These jobs generally require some process change and further discussion internally. 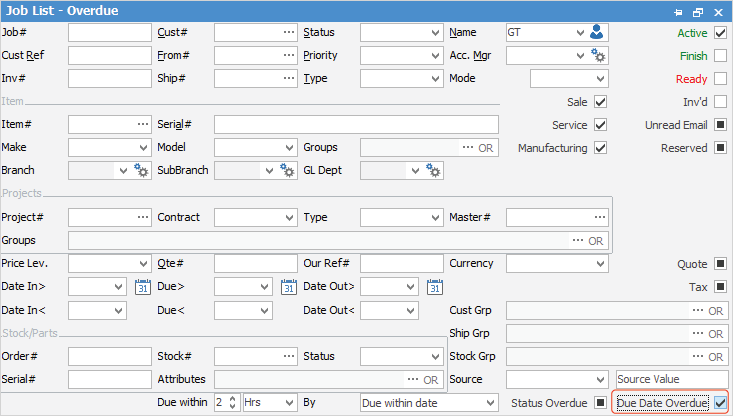 Parts list allows technicians and purchasing staff to flag when a job requires stock. A technician will assign a job to Parts to highlight the requirement that purchasing staff need to place an order. Ready list indicates jobs which are ready for invoicing to administration staff. 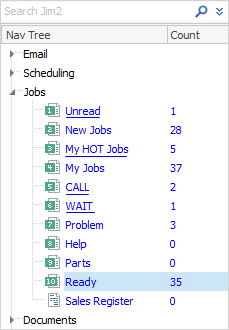 Overdue list indicates which jobs in your list are overdue and need to be chased up.